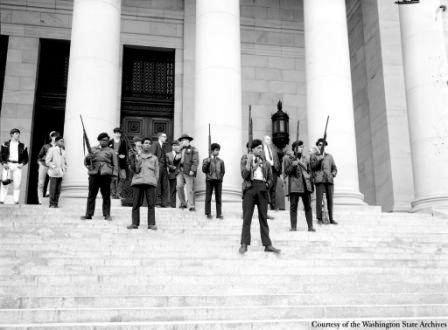 The Panthers are standing outside the Lincoln Memorial with guns ready and armed. They protested the streets by carrying guns and making a point that carrying a gun is legal. Members of the Black Panther party in Oakland, California protested a new ban on firearms in front of the California capitol building. Over 30 members were arrested and co-founder Bobby Seale was taken into custody. Shortly the charges were dropped. The panthers began carrying firearms openly due to California’s law allowing the carrying of firearms just as long as they are not aimed at anyone. Violence kept happening over the years, many people died, many were sent to jail and so forth. This being the first organized Panther protest you could say that things weren’t too chaotic compared to other events that had occurred. After the law was past and the first protest happened many shootout occurred and many people including innocent people died because of the incorrect use of firearms. Their first protest caught the public’s eye and was the start of an eye opener.